I am almost not bothering anymore to complain about the state of LL91 and the units attached to it, but here I have to ask: Why ? Pretty much the same is true for the Phase B mortars. Or why does the SAS-Demi-Brigade get 4 Canon CA25mm per card (which for 5 more points get important 200m more range and, surprise, 2 more HE), but LL91 only 3 FLAK 38 20mm in Phase A, while SAS has access to fighters at the same time. What does the 91LL bring to the table that the SAS doesn't top in some way? Planes with AT guns that hardly ever are worth the 200 points? 45 point Fallschirmjäger? Well jolly geeeh. Last edited by Wolke on Wed 9 May 2018 11:50, edited 1 time in total. What, specifically, are you concerned about with these mortars? 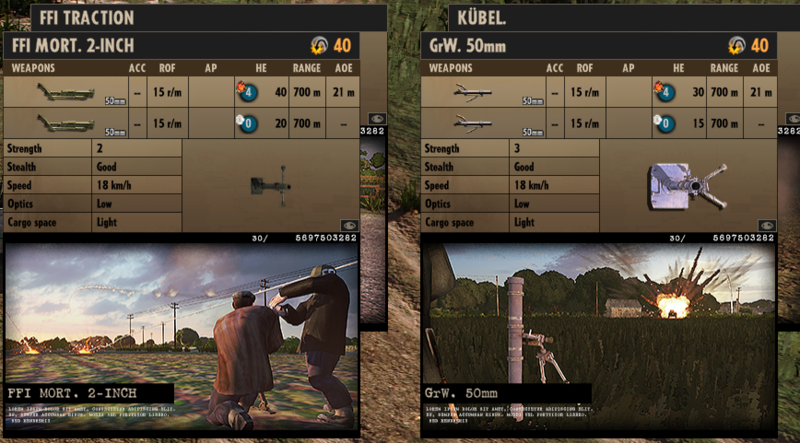 The German one has more health while the French one has more ammo, and otherwise they're identical. I see no issue. Yes. 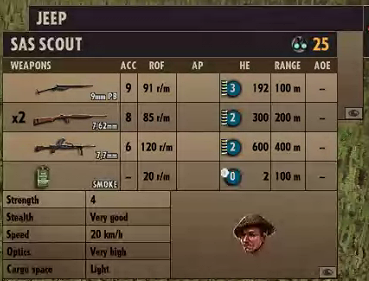 Not only does a team of two somehow manage to carry 15 more rounds (10 HE and 5 Smoke) than a team of three, I'd also argue that for this unit having a strenght of 3 instead of 2 is not really something you care about, while having ammo to do it's job for 40 more seconds is quite important. Then the DEMI-Brigade SAS also gets an additional unit per card. This repeats for pretty much all similiar units - the Demi-SAS one is better equipted, comes with more Vet or has some other bonus. I know that "Every division is balanced differently" and such, but I specificially am comparing Demi-Brigade SAS with the 91. LL because they both are marketed as Airborne Divisions with a good Air-Tab and low phase A income and 38 activation points, which by the way, I stuggle to have enough units for a game with for the 91. LL, while having no such issue with the Demi-SAS. 91. LL has some glaring weaknesses at the start, lacking AT in A, a pretty terrible tank-tab, no protected arty for later in the game, no fighter in A as well as a no AA to speak of, etc, while bringing AT planes with no Vet and Fallschirmjäger, which while good at 200-400m, are very expensive. I suppose the support STUG is also a notable unit. The Demi-Brigade opens up in A with less infantry, but has access to halftracks, a more interesting tank-tab, better AA-units in A+B (arguably even C), fighters to protect the ground attack planes, efficient and useful recon units and quite decent AT. And the infantry gets a very nice boost in numbers and combat-strength after phase A, while 91. LL is tapering off. What is up with that? How are the Fs-Spähtrupp worth twice as much as FFI Saboteurs? I dunno? Is that 1 HE more at 300m really worth 5 points, while the Fs. Spähtrupp can't even fire back 300+ and loses the engagement between 200-100m as well? Oh and SAS brings smoke, which has it's uses for a scouting unit. Why does SAS get two 2-star Vet fighters per card in B, while 91. LL gets only 1 at lower quality in C? Every tab I look, I see SAS getting either more per card of the same unit, or higher vet, or similiar capbilities for cheaper, while not having such glaring weaknesses like 91. LL. for Bad Fighters of 91. LL, i can say "Division type". they are "Infantry" Division, Not "Paratrooper" Division. look at 3rd FJ. They have two 2-vet Fighters you want.